It’s been an exciting week here at C+C. Not only did Colleen and I get to see each other for the first time in more than a year (! ), we spent a fabulous three days eating our way through New York City. We’ll have lots more to share about our NYC cheese adventures next week, but we won’t keep you waiting any longer for our report from the big gig: the 2009 Fancy Food Show. The Fancy Food Show is the biannual event of the National Association for the Specialty Food Trade (NASFT), and it’s like Nirvana for anyone who loves food. Since it’s a trade show, it’s not open to the general public, but as the co-writers/publishers of a top 10 cheese blog, Colleen and I were able to attend as part of the press corps. (We felt very official.) Unfortunately, our busy schedules allowed us to spend only four hours at the show and we barely scratched the surface, but we did get to visit a number of cheese-centric booths and taste lots of cheese. Winnimere review on Jasper Hill Farm’s Facebook page. (Thanks, Mateo!) Mary posed for a quick photo with us just hours before it was announced that her Truffle Tremor won the sofi for best product in the cheese/dairy category at the show. A well-deserved honor! We also had fun chatting with the folks from Faribault Dairy and Grafton Village. Learning about new cheese partnerships, such as Faribault Dairy and Grafton Village’s new collaboration on Clothbound Cheddar. Vermont-based Grafton Village now sends its Clothbound Cheddar to Minnesota to age in Faribault’s famed sandstone caves. British cheese powerhouse Neal’s Yard Dairy is also working with Colston Bassett Dairy to age its Stilton, and the union results in a creamier, tangier blue cheese that we really enjoyed. Finding some untasted cheeses on our list, like the triple-crème Brie from the Marin French Cheese Company and the Rogue River Blue from Rogue Creamery. (Washed down with a gulp of Rogue Chocolate Stout, yum.) Watch for our upcoming reviews over the next few weeks! Unfriendly French cheese exhibitors. The only way we were able to sample any French cheeses was to linger around the cheese displays for approximately 10 minutes before the person working the booth would even pay attention to us. Memo to the French: The reason why people come to the show is to taste your cheese. It’s really hard for them to do that if you ignore them. 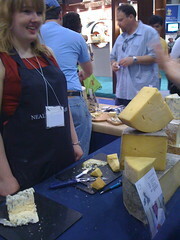 Absent American cheese exhibitors … and too much floor space. 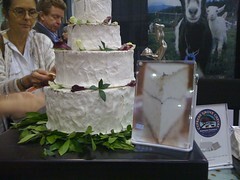 We had hoped to try more new American cheeses, but were disappointed to find the Capriole Goat Cheese booth unmanned. Others we just didn’t make it to (Utah’s Beehive, Coach Farm) in our short amount of time. 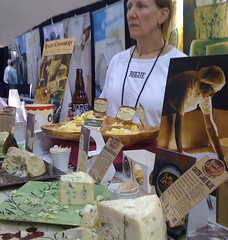 It would’ve been nice if the American cheesemakers’ booths were less spread out (own pavilion next year, perhaps? ), though I imagine people with more time to spend grazing benefited from other snacks between cheese samples. Our wimpy stomachs. We didn’t eat breakfast that day in order to leave room for lots of cheese samples, but we still became full relatively quickly. Perhaps it was the dozen or so cheeses we had sampled the day before. Or the large iced coffees we drank on the walk to the show. Or the three desserts we shared during the previous night’s dinner at Casellula. Anyway, we were stuffed much earlier than I had anticipated. I managed to recover in time to try a Magnolia Bakery cupcake at 10 p.m. that night. Colleen said she choked down half a sandwich during her bus ride back to D.C.
Did you attend this year’s Fancy Food Show? Any stories or tidbits to share? Spill them here! You’d assume that a cheese called Manchester would be British, but no, this one is all red, white and blue. Named for Manchester, Vt., this aged raw-milk cheese is a prime example of how a good goat cheese doesn’t have to reek of goats. The Consider Bardwell Farm in western Vermont makes the cheese from the milk of pasture-raised goats but then ages the 3-lb. tommes in Jasper Hill Farm‘s caves. 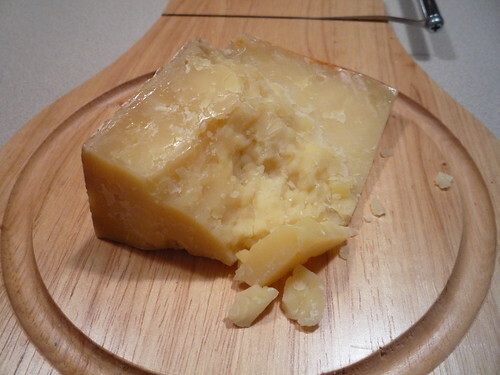 The result is a semi-firm, nutty cheese with a taste that reminds of jumping around in a hay-filled barn. If that doesn’t get you in the mood for summer, I don’t know what will! Artisanal Cheese recommends a Chenin Blanc as the accompanying sipper to Manchester, and I think any light, fruity wine would be a good match. I don’t know if rosés will be trendy this summer, but I’d be willing to give it a shot. Hell, I eat Lucky Charms in applesauce, so do you really think I care about wine trends? Being a Wisconsinite, I love my cheddar. Sharp, mild, aged, young – I love them all. I don’t limit myself to Wisconsin cheeses, even though I do take special pride in my home state’s offerings, because then I’d miss out on gems like Cabot Creamery and Jasper Hill Farm’s Clothbound Cheddar. How can two cheesemakers take credit for this cheese? In the words of a song from one of my childhood Sesame Street LPs, “Co-operation makes it happen!” Cabot Creamery gets the cheese started, but it is then cave-aged in Jasper Hill Farm‘s cellars. 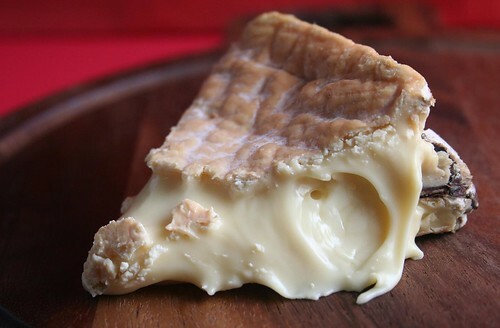 The result is a mild yet full-bodied cow’s milk cheese that has a comforting presence on your palate, even long after you’ve swallowed your last bite. 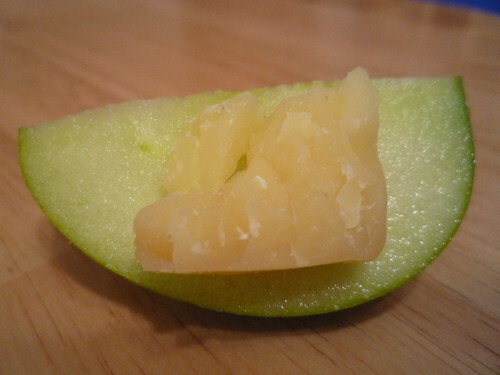 I usually enjoy my cheddar with apples, but I don’t think the Granny Smith apple I had on hand was the best match for this cheese’s subtle sweetness. I’d like to try it with my favorite, the Gala, or a Honeycrisp when the variety is in season. (Honeycrisps were developed in Minnesota, by the way.) Normally, I have my cheddar and apple as a mid-day snack at work, which means I’m not savoring them with a glass of wine, but Liz Thorpe, the wholesale manager at Murray’s Cheese, recommends a medium-bodied Chardonnay. 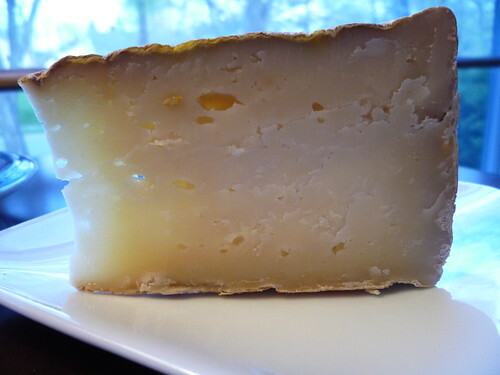 Cabot Creamery only produces a limited amount of Clothbound Cheddar each year, so act fast! If you have trouble finding it in your local cheese shops, mail-order may be the way to go. Cabot recommends checking with Murray’s Cheese or Artisanal Cheese for availability. And now we get down to business! In the spirit of Thanksgiving, we’re starting our tasting journey by expressing our gratitude for outstanding American blue cheeses. For our first cheese, I chose Bayley Hazen Blue by Jasper Hill Farms in Greensboro, Vermont. The Kehler brothers didn’t intend to become dairy farmers when they took on a dilapidated hillside farm in 1998, but developed an interest in sustainable agriculture as they witnessed other Vermont dairy farms going out of business. They began their herd with 15 Ayrshire heifers in 2002, and the care and dedication they’ve put into their operation is evident in their cheese. 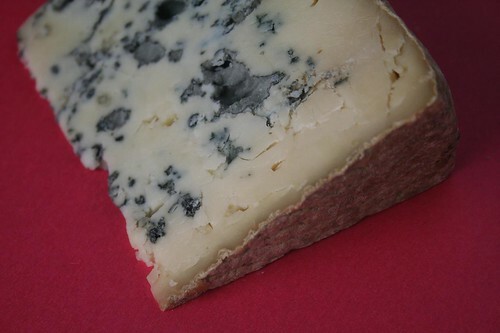 The Bayley Hazen is a creamy, tangy, raw-milk blue that strikes just the right balance of salty bite and grassy sweetness. It is not an overwhelming blue, so it is perfect for cooking or crumbled over a seasonal beet salad. 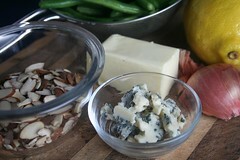 I used it to top my Zesty Green Beans Almondine, and found the lemon zest really brought out the flavors of the cheese. If you were serving it on a cheese plate, I would be sure to include something sweet like dried fruit, maybe even candied citrus peels. If you’re serving it after dinner, a port or other sweet wine would be a perfect pairing. This seems to be a fairly popular cheese at the moment, and deservedly so. It was available at Cheesetique and I have seen it on several DC-area restaurant cheese lists, including at Restaurant Eve. You can consult the retailer list on their website to find it near you. Want to catch the latest reviews as soon as they’re posted? 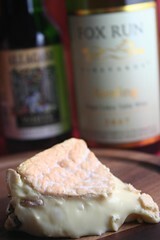 Follow @100cheeses on Twitter for updates straight from our cheeseboard!